2015 marks the 45th Anniversary of the largest raza-led mobilization against the U.S. imperialist war in Vietnam and against the conditions of oppression and exploitation of our historically indigenous people by this colonial settler society on our own land. 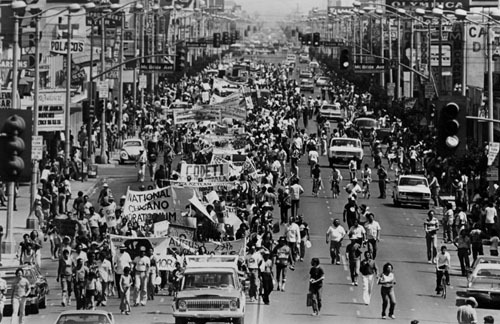 The August 29, 1970 Chicano Moratorium was the culmination of many pickets, teach-ins, and marches/rallies throughout Aztlán during that historic year where calls for Chicano Power were raised in unison with calls for Black Power, Indigenous Power, national liberation movements throughout the hemisphere, and revolution throughout the entire world. Yet, we must not forget that the day ended with a brutal repression. That day 45 years ago our movement for Chicano Mexicano self-determination was viciously attacked by organized state violence carried out by the Los Angeles Police Department, LA County Sheriffs, and California Highway Patrol. The attack against our movement had been in the planning for months and led to thousands being injured, hundreds being arrested, and several people killed. The police-led assassinations of Brown Berets Lyn Ward and Angel Diaz, and the journalist Ruben Salazar, was a message to our movement that the state would use all of its means to silence our calls for self-determination. Ruben Salazar was well known for his news reports on KMEX and the Los Angeles Times that often exposed racism and brutality in law enforcement against the Chicano Mexicano community. So they killed him in the Silver Dollar Cafe on Whittier Blvd. 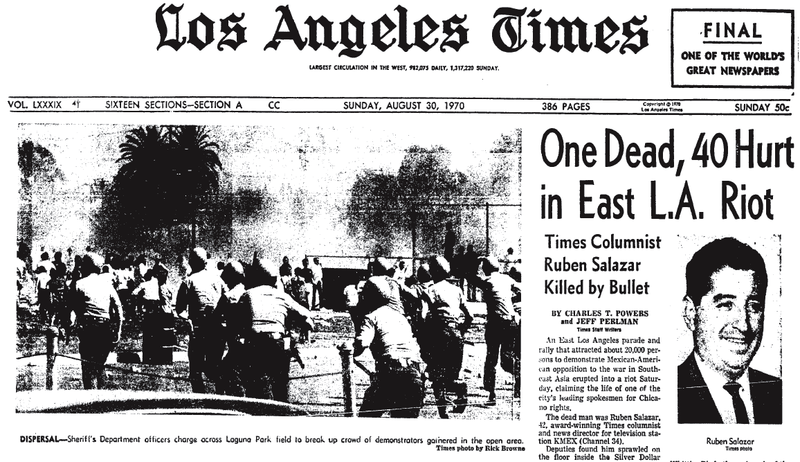 The specific attack against the organized group of young Chicanas/os known as the Brown Berets (Angel Diaz and Lyn Ward) as well as the voice of Chicanas/os in the reporting of Ruben Salazar, had the entire system in a situation where the only way to “deal” with our people was to disrupt our political events using direct state violence. What should be emphasized is that our people on that day did not sit idly as they were beaten and shot. Many people that day fought back all along Whittier Boulevard, and eventually ran the police and sheriffs out of the barrio. It was one of the most important events and acts of resistance in our history, and it was one of the most significant events of the seventies taking place at the height of the Chicano Power movement. This mobilization represented an act of organized resistance by the colonized to self-determine our own political agenda on our own land. So why is it that this date is no longer given much attention by many of our current political “leaders”? Why do many of our “younger activists” (and too many of our older ones — who should know better) only dedicate a moment of passing interest to this historical date? 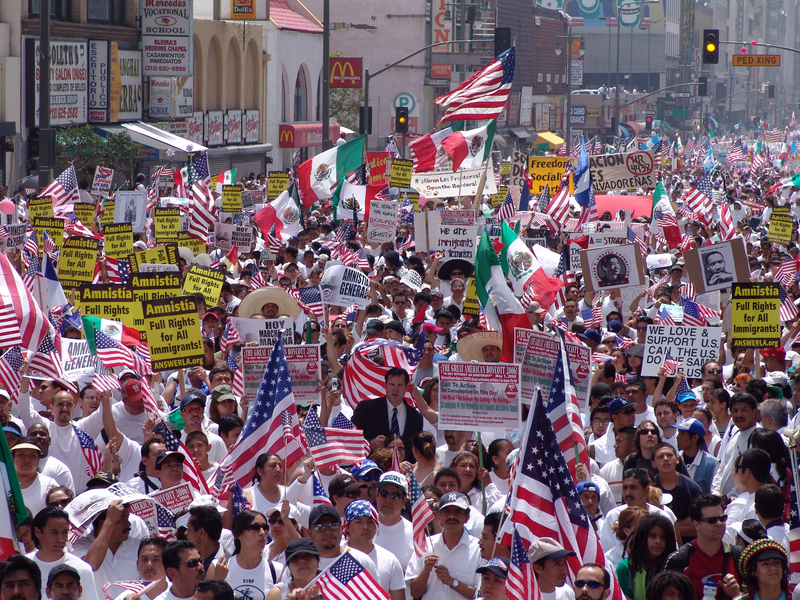 Finally, we have those forces who tell us that the Chicano Moratorium and any manifestation of “Nationalism” and Chicano-Mexicano Power politics is “sectarian,” and keeps us from building unity with allies. Of course, they are not talking about alliances among oppressed people, with other workers, nor within our own communities. Dismissing Chicana/o history as sectarian is a code for not wanting to upset the current political order, the democratic party or its affiliates. Usually “voices of moderation” are more about using our movement as leverage to win political favors from elected officials than they are about building alliances. What Happens When A Movement Loses A Sense Of Its Own History? What does political struggle look like when it loses its sense of history? It is what we have seen during the last 10-15 years, with large Facebook and Twitter mobilizations, with few (if any at all) calls to build a liberation oriented organization, and no calls for political power on our own terms. Protesting takes place and it is usually within the parameters and frameworks established by the existing political parties and are then used to reform the existing capitalist order. What we have today is more activism and marches, but less collective political consciousness than in the 1970s. One clear example of how our “movement” has lost political consciousness can be seen in how we have handled the question of “immigration” during the last 25 years. During the 1990’s we were told that our movement should concentrate on fighting the “racist” republicans, meanwhile the policies the democrats enacted under the Clinton administration oversaw the neo-liberal implementation of the North American Free Trade Agreement (NAFTA), imposed the largest militarization of the border, and pushed for the mass incarceration of our communities in the form of the Clinton Crime Bill. Still, raza were convinced that pursuing citizenship and voting democrat were the only politically viable options for our communities. When Unión del Barrio would argue that our priority must be to build a revolutionary organization, our ideas were dismissed as radical rants left over from the 1970s. 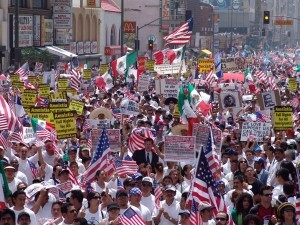 If we lose our collective history, then is becomes impossible to remember that during the 1990s there was loud racist rhetoric about “anchor babies,” revoking the 14th amendment, the need for massive deportations of millions of raza, expanding the border wall from California to Texas, etc., but it mostly came from white nationalist groups like “White Aryan Resistance,” “American Spring,” or the “Minutemen.” Today, these racist talking points have gone prime-time, and are now essential applause lines for every republican presidential candidate. economic-military plans to attack raza workers from El Salvador, Honduras, and Guatemala. Yet, so-called Latino political leaders in 2015 still argue that pursuing citizenship and voting democrat are the only politically viable options for our communities. And when Unión del Barrio argues that our priority must still be the building of a revolutionary organization, our ideas continue to be dismissed as radical rants left over from the 1970s. Instead we follow news programs and newspapers filled with statements demanding that our people should be dressed in white when we protest, that we lower our Mexican flags and other national flags, that we should hoist up more American flags, and we continue our “demand” for “Comprehensive Immigration Reform.” They advise us to go out of our way to not offend the existing political system while we protest. These examples illustrate one root of the numerous problems our communities face within what is broadly defined as “our struggle.” Sadly, “our struggle” is too often defined in terms of how the existing political order sees us, and almost never on how we see ourselves. This is not what political struggle should be about. 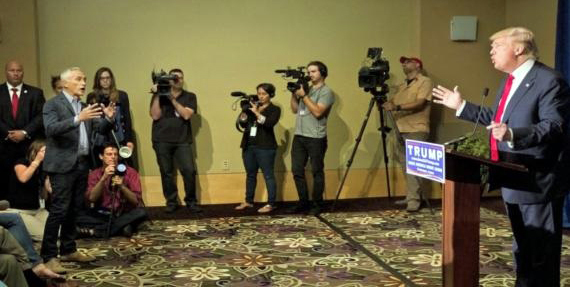 For example, the tremendous amount of attention recently focused on Donald Chump and Jorge Ramos. Activists and community members see this media circus as something representing “our struggle.” This media circus is, by definition, a diversion, mediated by cable news programs and social media and primarily designed for the self-promotion of politicians (Donald Chump) and self-appointed leaders (Jorge Ramos), rather than something that is seeking to better the conditions of our communities, much less something that will make our communities get more involved in serious forms of political struggle. Our fixation on the Donald Chump and Jorge Ramos drama is evidence of how our “movement” has lost political clarity since 1970. Often we hear talk about the “dumbing down” of this media saturated society. Our movement internalizes the consequences of this “dumbing down” when we lose awareness of our collective history. We have to ask, what good does it do to have 10,000 people in the streets marching if they are marching primarily to demand acceptance into the existing political and economic order, or where active political participation is measured on “likes,” “shares,” and 130 characters on the screen of some device, without any kind of political accountability to an organization or collective of people. We must accept what history has proven – that democrats and republicans represent two heads of the same monster. We must grow-up politically and accept the urgent need to forge an organization for liberation, self-determination and Participatory Democracy on our own land. We must fight to reclaim the value of our labor and to build a viable and sustainable future. We must struggle and unite against all forms of imperialist aggression, notably that aggression which threatens the Bolivarian Revolution in Venezuela, Bolivia, Ecuador, Argentina or Brazil, in spite of the lies Jorge Ramos likes to spread. Finally, we must unite with the rest of humanity to overturn the parasitic economic relationship that U.S. society enjoys at the expense of the rest of the world. This is what August 29, 1970 should teach us about the present, and this is the banner that we carry as Unión del Barrio on this day, our 34th anniversary, since our organization was founded on August 29, 1981 in commemoration of this important date. These are the lessons and the tasks that those of us who are serious about changing the conditions we live in must be willing to struggle around. We need to sacrifice, unite, and organize as compañeras/os en la lucha on this 29th of August and every other day, wherever in Aztlán we happen to be. This August 29th we proudly hold strong to our historic task of bringing our people into liberation struggle, to organize for the self-defense of our community, to build dual and contending spaces of struggle, and to unite with the poor and working class of Nuestra América. This entry was posted in 2015, 2015 Events, 2015 Statements, Analysis, History, Los Angeles News & Events, Media Related News & Events, Organizational Updates, Police & Migra. Bookmark the permalink.